I hope you had a wonderful holiday. I know we did. Since I had to wait until Christmas was over to share a couple of gifts I made and had a part in making. A friend celebrated a BIG birthday right before Christmas so a group of us got together to mark her big day. Then we did a gift exchange and I pulled this same person's name. That made it easy to decide what to do for her for Christmas. This is an armchair caddy. I used the pattern I found here. Very easy but turned out well I think. Her directions and pattern were wonderful. I could have done more embroidery on it, but then it would have been a Valentine's gift as opposed to a Christmas gift and that is not what I was going for. 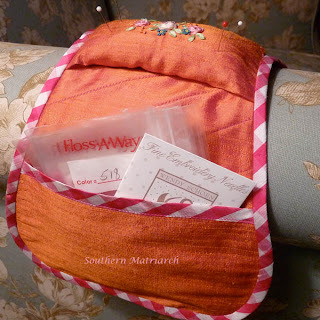 If you are looking for a nice gift for a sewing pal this one fits the bill. It is made from silk dupioni in an orange that is shot through with hot pink. That doesn't show real well in pictures. Then trimmed and lined with hot pink/white gingham. Added a touch of SRE to the pin cushion and voila! If you need a gift I would recommend this one. 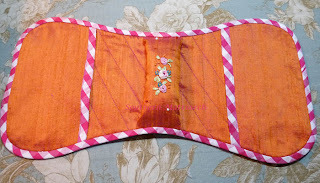 For her birthday we made a reticule as immortalized by Beverly Sheldrick. I can't even count the number of these that I know friends have made, won or bought. My contribution to the gift was I did the embroidery on it. 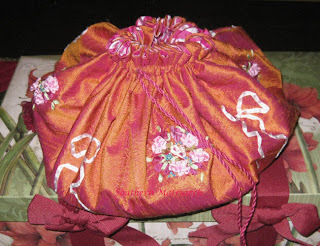 Another friend constructed the reticule. She did a great job. 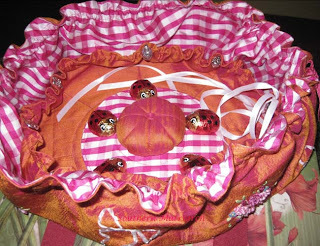 The ladybugs are chocolate, not embroidery. These reticules are great to carry a project in and they hold way more than they appear they would. What gifts did you make? It is beautiful! I didn't expect anything less. 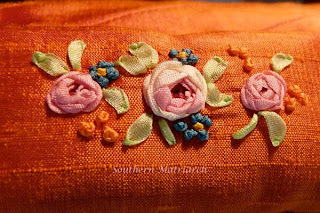 I'm sure she was thrilled to get a companion to the beautiful reticule. I made something for a friend too. I don't think she's received it yet so I can't say what it is, yet. I made something for a friend, cut my finger, in the cutting the finger made a bad cut and had to resew... however, until she gets it I will not say what it is. :) I love your addition!! I bet she cried again! 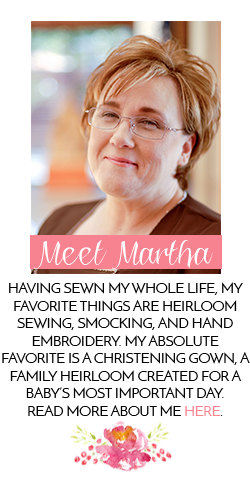 What a lovely & useful gift, Martha! 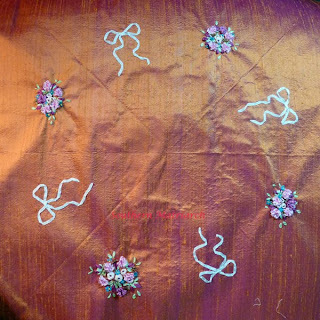 Your ribbon embroidery is flawless & I bet the recipient will treasure this item for years to come. Thanks for the link to the pattern! The only gift I made this year was a dress for my DGD, Caroline...the "Angel" pattern by Connie Moses from AS&E's last issue, except I didn't get to finish it, due to hubby's heart attack. The smocking & beading are completed & the bows are made, sleeves cut & waiting. I'm taking it with me to my friend's "Smock & Talk" group gathering for some help with tracing the yoke pattern. Sometimes AS&E can be so confusing! I don't want to ruin it at this point either so I'm waiting on some expertise. Sure wish you lived closer! They are "beautiful". I am sure everyone wants to be your friend!! I would like to know just how difficult the armchair caddy is to make? It is a wonderful idea and family members would appreciate not getting pricked by the needles on the arm of the chair! How fun is it to see these pictures....You are a talented and generous friend. So blessed to know you. Both of these are stunning!! I am in love with those colors!!! I made a similar one for my DDIL's bridemaids, but they were nothing like this!!! Your beautiful work always inspires me!! !